These coolers were pretty good, but I took some short cuts that definitely made it a little less amazing than I had hoped. But I do look forward to trying it again really soon! 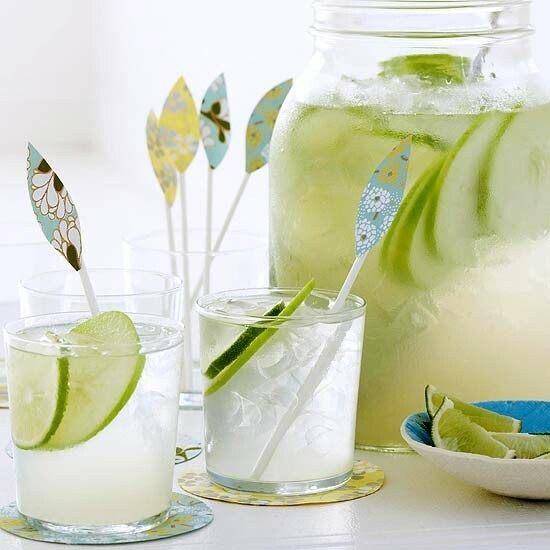 In a large pitcher or jar, mix 3/4 cup lime juice (I used limeade and it didn’t work as well as fresh lime juice would have); simple syrup; 1-1/2 cups rum; 1 to 2 green apples, cored and thinly sliced; and 1 to 2 limes, thinly sliced. Add ice. Stir. Serve in drinking glasses topped off with chilled club soda. I used both rum and tequila, and I even threw a can of beer in there. To me, my mix tasted more like a margarita on the rocks than an “apple lime cooler.” It was still delicious, don’t get me wrong, but I think I rushed into the recipe too much to make it right. I wish there had been some kind of apple flavor in it. Maybe next time I’ll do it with half Bacardi Superior and half Bacardi Big Apple. To make simple syrup: Bring 2 cups water and 2 cups sugar to a boil. Reduce heat, simmer 5 minutes, and let cool. Makes about 3 cups.